Three women who secretly gave their new-born sons up for adoption in 1945, wonder if the 5-year old survivor of a plane crash, named in the local newspapers, is their long-abandoned son. A small town newspaperman's investigation into a local bookie operation turns up a web of organized crime. Don't judge these girls until you know their Three Secrets. Paul Radin: [Before leaving for the military] There's someone else. Susan Adele Connors Chase: Someone else? Paul Radin: Back home. Before I met you. I... I can't forget her. I tried to but I can't. Paul Radin: Do you really love her? Paul Radin: We went to school together. We've known each other since we were kids. Susan, I can't even explain it to myself. All I can ask is please forgive me... Say something. Say goodbye to me. Tell me you hope I get killed. But don't just stand there looking at me. Three women review their past lives while they wait for news that will change the future totally for one of them. But it isn't "Letter to Three Wives"! 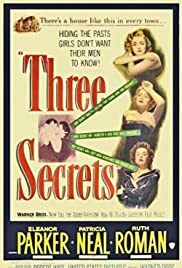 Putting aside the shameless use of the formula from Mankiewicz' masterwork, "Three Secrets" is an enjoyable, well-written drama. Another similarity to "... Three Wives", and one that I have no objection to, is leads Patricia Neal, Eleanor Parker & Ruth Roman being mature, extremely attractive women; not a teenybopper or nymphet in sight. A second movie that came to mind while watching "Three Secrets" was "The Big Carnival" with its media circus of cynical reporters covering and exploiting a disaster. However Wilder's film followed this one. The beautiful Cole Porter tune `I get a kick out of you' is well used on the soundtrack.